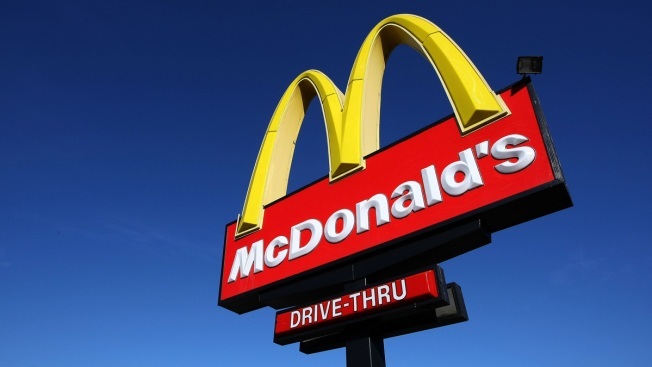 In this Feb. 9, 2009, file photo, a sign stands outside of a McDonald's restaurant in San Francisco, California. A McDonald's customer is being called a hero after he shot and killed a masked gunman who opened fire inside one of the fast-food chain's restaurants in Alabama. The shootout happened at a McDonald's in Birmingham. Employee Markus Washington said he was cooking burgers shortly before closing when he heard several gunshots. He said he and another employee scrambled into a freezer and hid while more shots rang out — at least 15 total. "All we hear is like different gunfire," Washington told WBRC-TV. "So in my mind, I'm imagining everybody is dead." A man wearing a mask barged into the restaurant and began shooting as the manager was locking the doors Saturday night, Birmingham police Sgt. Bryan Shelton told local news outlets. A man who was leaving the McDonald's with his two sons then drew his own gun and shot the masked man, who later died at a local hospital, Shelton said. The armed customer and one of his sons, a juvenile, were also wounded. "Right now it appears the victim made a decision that cost his life and the father made a decision that preserved his and (his) children's' life," Shelton told al.com. Sgt. Johnny Williams, a Birmingham police spokesman, said Monday the father's and son's injuries were not considered life-threatening. Police did not release the slain gunman's name Monday, and Williams said it was being withheld pending notification of the man's relatives. He said police don't plan to release the name of the armed customer unless he gets charged with a crime. Washington, the employee who hid in the freezer, had nothing but praise for the customer who fought back. "He's my hero," Washington said. "Because I can only imagine how it would've went if he wasn't armed."